The Workrite Revo Keyboard System combined with the Pinnacle 2™ keyboard arm. 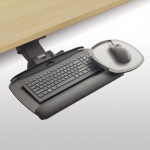 The Workrite 2227 Revo Keyboard System is a popular solution for those who prefer to use the mouse positioned over the 10-key pad, or for users with limited reach. Order on-line today. FREE Shipping!